It’s no secret that I love Christmas. What a fun and joyful time of year! I’ve been blessed to only have happy Christmas memories, and I hope that I can create lasting memories for my kids as well. I thought it would be fun to share a collection of memorable family Christmas traditions, just in case there’s someone out there looking for something new to do with their family. I’ve seen a lot of people ask others lately about what they do for Christmas, so hopefully this will give some of you some new ideas. There are lots of different ideas here. Some are super simple, others require a little more effort. What’s important is just spending time with those you love and Christmas traditions are a great way to do that. 19 Memorable Christmas Traditions that your family is going to love! I think most people write letters to Santa Claus at some point or another during Christmas-time. I know I always did! The hardest part was waiting to get that much anticipated letter back! Last year we were a little late and Abigail got a post card from Santa vacationing in Florida. While I make cookies all season long, it’s kind of fun to set aside a day or two where everyone bakes yummy treats together! You can do this to make plates to deliver to friends and family or just for everyone to enjoy together. Most people have probably heard of Elf on Shelf. As much as I enjoy watching other people share what their elf does every day, I didn’t think I would have ever adopt this Christmas tradition but, this year we did. You can check out what Jolly was up to here However, I know a lot of people really enjoy it each year and look forward to the elf arriving! Plus, Pinterest has TONS of ideas in case you aren’t super creative. I think Advent Calendars are the best Christmas Tradition in my opinion. They can be simple or extravagant, but either way, they are fun for the whole family. We have a fabric one handed down to me that we use but I found this great round up of Advent Calendar Ideas for families. I also found these great ones on the Dating Divas website. If you have a lot of kids in your family, this is a great way to keep spending to a limit. We haven’t done it in a few years but I think it makes it easier to be a little more personal with your gift giving. I always loving trying to come up with the perfect person for whoever I pick. You can make it a secret, put a price limit on it, or require the present to be homemade – the sky is the limit! We always would open one present on Christmas Eve too! There are so many beautiful lights that are up this time of year. I’m impressed by all the displays people put up! We always love going on Christmas Eve but you can really go anytime during the Christmas season. You can find lists of the best displays in your area online. When we were younger, I remember driving forever (or what seemed like forever) to see some of the most amazing Christmas light displays ever. It’s also pretty fun when you run into a house that has their lights tuned with a local radio station. This is something I haven’t done since my oldest was small. We made up plates of goodies to take to our friends, and we serenade them with our beautiful (ha!) voices. Everyone always seems to really appreciate it. Jennifer had so much fun putting together the plates this year, and she loved carolling even more. This is a fun way to build up the anticipation for Christmas morning! In our family, we open one gift on Christmas Eve (usually it’s a pair of new pajams and a book.) You could do this any way you wanted though – whatever! It’s just fun to do. There are so many great Christmas movies out there – why not make it a new Christmas tradition to watch a few throughout the season? You could watch one every night, have a movie marathon on one day, or let everyone pick their favourite one to watch during the month. Making decorating your home a family affair! Turn on some Christmas music, make some hot chocolate, and just enjoy being together as you make your home a little more jolly. Most kids get some kind of toy on Christmas. If you aren’t careful, you can end up with a lot more toys than you need over the year. I’ve heard of a lot of people doing something like this, and I think it’s really smart. Basically, your kids pick a couple of toys they no longer want or play with, and you donate them to charity or someone who is in need. It teachers your children to help others, and it also clears our your toy room for the new Christmas goodies! This one may seem pretty obvious, but it’s worth mentioning — putting out cookies for Santa. I’m pulling together a post about 25 cookie recipes that a perfect for Santa in case you need some inspiration. We would always put carrots on the plate of cookies for the reindeer, but I know of people who would sprinkle reindeer food on the grass or snow outside. Here’s a recipe for magic reindeer food. There are always so many different Christmas activities going on during December. While you can’t do everything, at the beginning of the month, you could sit down with your family and come up with a bunch of different ideas of what you want to do during the month and start your Christmas Bucket List. We always make an effort to go see Santa Claus each year. I think having pictures of your kids with Santa throughout the years is priceless. I absolutely love seeing the ones of them when they were little. We always try to find a Santa that lets us take our own pictures, because, lets be real – the cost for Santa pictures is ridiculous. This is another tradition that my family did when I was a little girl. On Christmas Eve, my dad will always read The Night Before Christmas, from an old, tattered book. This is a classic story, and I think it can be really magical to read it on Christmas Eve. Once my kids became of school age I could guarantee that we would always got a new ornament every year and it was always so fun to get a new one to add to our collection. When Barry and I got our first Christmas tree, the first ornaments that we had to put on it were the crafts that we made when we were small so it’s really neat to continue with the tradition. I stitched our names into our stockings just last year, and even though I didn’t “make them” they turned out better than I expected them to, I love them! Making stockings for your family can be a fun idea, and I imagine they are something most people will cherish throughout their lifetime. Wow! That took a long time to write out. I hope that at least someone finds this list of Christmas traditions helpful, and that in some way, I’ve helped you create some lasting memories with your family. « Write a letter to Santa and he’ll write back! So many great ideas! We are already doing the Cookie Baking Day and Advent Calendars. I bought my daughter a personalized Night Before Christmas on Christmas book, so we’ll sure read it too. What a great list…such great ideas!! I can’t wait to do some of these with my kids when they get a bit older! I am a huge christmas lover, when I was a kid we looked forward to it because mum cooked dishes that she didn’t normally cook throughout the year these were reserved for christmas only. Such lovely ideas you’ve shared. I know this post is geared toward activities with the little ones, but my boyfriend is from Europe and this will be his first Christmas in the states. I’m going to steal some of these ideas to make sure he gets the full American Christmas experience! lol Thanks for sharing! There are really many traditions surrounding this season. I think these are great and helpful tips. I remember a lot of Christmas traditions from when I was younger. These are all great traditions to do with kids. I love Christmas, I always used to write a letter to santa and left milk and cookies out. I visit winter wonderland in London every year. We enjoy baking cookies and looking at Christmas lights. I keep meaning to start the Elf on the Shelf tradition but it hasn’t happened yet. It looks like fun. Thanks for sharing my advent calendar activity ideas! 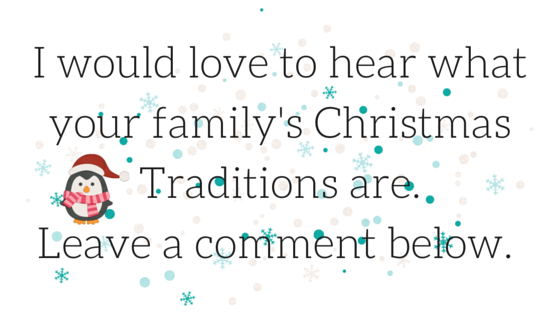 These are great family Christmas traditions. We love baking cookies together. It’s fun for the kids and we all enjoy tasting our creations afterward. Those are some great traditions. We do a lot of them but definitely not all. I love taking the kids to look at Christmas lights. It’s my favorite tradition. We open one present on Christmas Eve – it’s traditionally fun Christmas jammies. Just one of the traditions we love so much! Now that I have grandkids, the grown-up kids draw names and everyone buys for the grandkids. Of course, I get them all gifts and usually go way overboard. 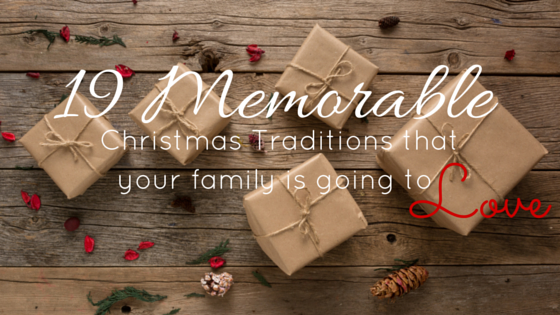 Christmas traditions are so important and we have quite a few in our family. WE love to look at lights and visit the Trail of Lights. We also usually do a gingerbread house! So much fun. I’m loving these traditions. We’ve never opened presents on Christmas Eve but it could be fun to set some special gifts aside for that night!